Ranked in the top three by U.S. News and World Report, the 2018 Porsche Macan is definitely one of the best compact luxury crossovers in a field of 15. Car and Driver magazine ranked it number one. What makes this vehicle such a good pick? It appeals to driving enthusiasts with exciting engine choices. The crossover excels at safety, ride quality, and technology. Beautiful inside and out, the Macan is an unmistakeable luxury choice. From the curb, the SUV disguises itself with a racy greenhouse, an arced aluminum hood, and special side blades. At its tall ride height, this hatchback declares its utility side. A large cargo area helps solidify its utility credentials. The cabin is upscale and sporty. The refined, high-class feel comes from a handsome design render with high quality elements and true craftsmanship. This may not be a Porsche sports car, but it dresses to impress. It even has some off-road nerve thanks to its high stance and all-wheel drivetrain. Riders will appreciate its ride quality while drivers will brag about its engaging demeanor. A choice of engines lets you command either 252, 340 or 400 horsepower. Sprint times are impressive for these utility vehicles. The Macan S does 0 to 60 mph in 5.2 seconds. Turbos trim that to 4.6 seconds. Technology definitely takes center stage in this advanced machine. Porsche uses a seven-speed automatic with an auto start/stop function. Porsche Traction Management regulates wheelspin for real stability. Single-piston floating calipers assist the rear brakes. An electronically controlled damping system improves responsiveness to driver commands even on poor roads. The automaker takes no chances with your safety. It has eight airbags and a list of crash avoidance aids. You can get a forward collision warning, an autobrake, a blind spot monitor, and a lane keeper. A 360-degree camera gives the driver a bird’s eye view during slow maneuvers. Dash entertainment is also emphasized. The Porsche Communication Management system includes a high-resolution touch display. An integrated proximity sensor adds to ease of use. You can enjoy streaming audio or play music from your internal hard drive Jukebox. Also aboard, you have CD, DVD and SD card readers. Connect apps include a navigation aid that lets you send information from your laptop or phone to your onboard computer. Few crossovers offer to pamper you like the 2018 Porsche Macan does. 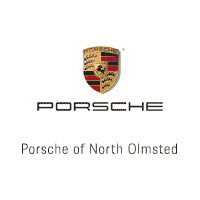 Try it out with a test drive at Porsche of North Olmsted.